Last year, I made a test – Eating cheese and dairy products. That was few months after my lap chole (Laparoscopic Cholecystectomy) operation. Even without gallbladder, I ate a home-made burger with cheese, butter and mayonnaise and to test how my system would react to dairy products. And the outcome of the test – upset stomach, gas was formed and grumbled inside my stomach. Although it was not a system overload, but it was a warning. And recently I ate cheese sticks. Cheese is one of the food to avoid for persons without gallbladder. And to note, I dipped it with mayonnaise. It was a home-made cheese sticks. The cheese was was sliced, then placed, rolled, and wrapped in a Shanghai spring roll wrapper or the lumpia wrapper. Then it was deep fried until golden brown. 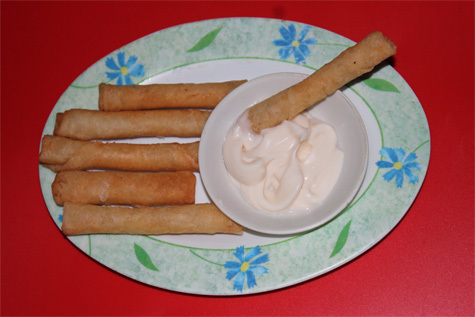 And the result – a tasty, delicious cheese sticks. But how well did my digestive system react to the cheese plus the mayonnaise? I ate all the 6 cheese sticks because they were my share. So with 6 cheese sticks dipped in mayonnaise and a person with no gallbladder, what would you expect? An upset stomach? Passed or failed? Oh, well – gladly there was no adverse reactions. My system took it normally; no upset stomach, no gas formation, no diarrhea – nothing. So eating cheese sticks without gallbladder and dipping with mayonnaise? PASSED! I see a lot of quality posts in http://www.lifewithoutgallbladder.com ! http://www.lifewithoutgallbladder.com is my TOP website!